I say! We appear to have one of the Twitters! Don't be shy! Why not give us a Twittery thing right now? The Ministry of Improv is the unofficial non-government fictional department for improvised comedy, and proudly boasts no attachment to any official Government body in any way (jut in case we needed to make that clear). 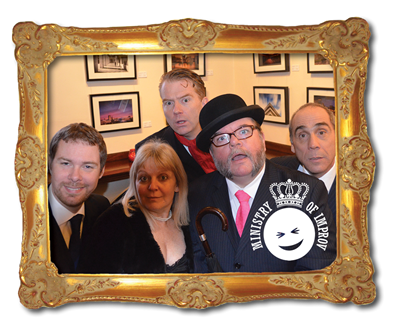 We provide high-quality improvised comedy at The Old Joint Stock and elsewhere. The Ministry is a Birmingham-based comedy improvisation group featuring the region’s most available improvisers. It also includes guest performers from other local groups. Four of the Ministry’s Directorate of Amusement, Fun and Theatre (DAFT) were members of Foghorn Improv, who performed at The Old Joint Stock Pub Theatre every month for three years. Foghorn Improv hit the road as a touring company in September 2015, and it was decided that a new Directorate was required to oversee the insatiable special needs of the regular OJS audience. Those DAFT ministers are Lee Dempsey, Matt Vaughan-Wilson, Karen Benjamin, Paul Messer and Simon Britton. Our other DAFT Minister, Jon Trevor, is the principal of Box of Frogs, where the other Ministers trained to the highest standards available amongst talented peers – a bit like Eton, but significantly cheaper. Ministry of Improv Nights at The Old Joint Stock. 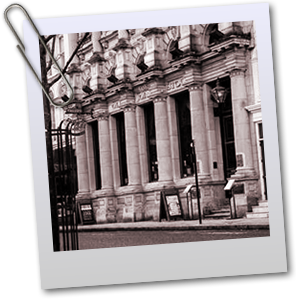 We have occasional shows at Birmingham's fabulous Old Joint Stock pub! Make sure you sign up to our Mailing List so we can let you know when shows are coming up! The Ministry of Improv is a Midlands-based improv comedy sketch group with regular shows at The Old Joint Stock Pub & Theatre in the heart of Birmingham City Centre's financial district. The group is made up of experienced and enthusiastic performers who love getting together and having fun, inspired by the weird and whacky suggestions of our lovely audience. Improv, or impro, is a fun and growing movement that - basically - makes it up as it goes along: The Ministry don't have scripts, characters or even ideas before we start a show - but we do love to have a theme as this gets our audiences creative juices flowing. For those of you who are old enough to remember "Whose Line Is It Anyway?" on the telly, that's sort-of where we begun, but improv has become much more than that! We promise to NEVER pick on audience members or single them out to come on stage and do uncomfortable things, but we do ask our audience for their ideas during the course of a typical show. Sometimes, we might ask you to write things down beforehand, but we may also ask you to shout out all sorts of random things - but we will NOT embarrass you in front of anyone! This website is maintained by PlanetSimon.